Frank Andre, age 94, a longtime resident of Medford, passed away peacefully, September 21, 2016. He was the beloved husband of Norma (Luongo) Andre and together they shared seventy years of marriage. Born in Worcester he was one of five children of the late Michael and Phyllis (DeRosa) Andreottola. Frank was raised and educated in Medford and was a graduate of Medford High School. Frank was a prominent local businessman and a true entrepreneur enjoying success in different business ventures. He owned and operated the Medford Cinema for many years as well as Andre Construction Company Inc., which built hundreds of homes in Medford in 1950’s and 1960’s. He also loved thoroughbred horses, owning and operating the Andre Stable for many years that had a string of horses that campaigned at New England racetracks. However his greatest joy was his family. He was an avid sports fan and he cherished being the number one fan of his son and then two grandchildren whenever they were participating in different sports over the years. He especially enjoyed being a fan of his son’s semi-professional baseball team, The Andre Chiefs of the Intercity League. In addition to his beloved wife, Norma, Frank is lovingly survived by his devoted son, Chuck Andre and his wife Kathy of Medford. He was the doting and loving grandfather of Michael Andre and his wife Gwen of Medford, and Carla Andre of Medford. He was the cherished brother of Lena Mills and her husband Frank of Medford, the late Frances Belmonte, Anthony Andre and Nicholas Andreottola. Also survived by many loving nieces and nephews. The following story appeared in the Boston Globe on August 28. The Lexington Blue Sox captured their second straight Intercity League baseball title on Tuesday night with a 5-4 victory over Andre Chiefs at Morelli Field in Melrose. 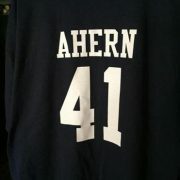 But their celebration was subdued, their thoughts quickly turning to prayers for their stricken teammate, Dave Ahern. A 28-year-old outfielder/pitcher who starred at Bedford High and then Babson College, Ahern has been treated at Tufts Medical Center since going into cardiac arrest last Thursday. According to his family and Blue Sox manager Rick DeAngelis, Ahern had not regained consciousness since last week. 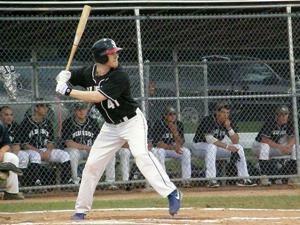 He had suited up for the Blue Sox in the quarterfinals and semifinals of the Intercity League playoffs. His No. 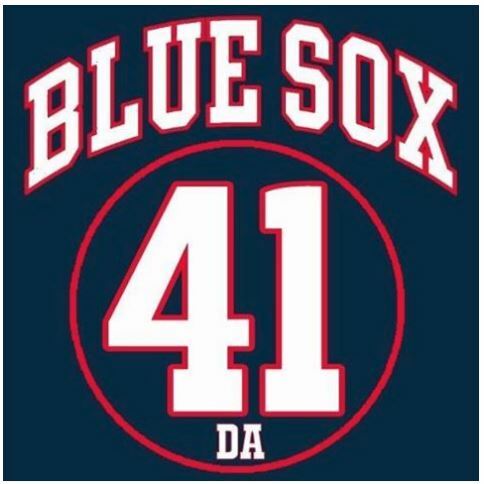 41 uniform was displayed in the Blue Sox dugout and also delivered to his hospital room where family, friends and teammates – past and present — have congregated. 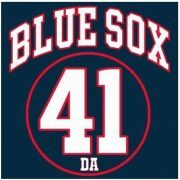 Blue Sox players also wore navy blue AHERN 41 t-shirts under their game uniforms and ‘DA’ decals on their helmets and caps as they swept the three-game series against the Chiefs. 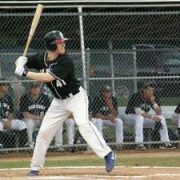 Dave Ahern hitting for the Blue Sox (courtesy Lexington Blue Sox). “Dave started playing for us in 2012 and right away became a major contributor, a team leader and a mentor to our younger players,’’ said DeAngelis. Last Thursday, before he was stricken at his home, Ahern went to the Granite Links Golf Club to sharpen up for a tournament the following day benefitting the Babson baseball program. He works fulltime as a sales manager. As a Babson senior, he hit .438 while compiling a 5-2 record on the mound with a 1.19 earned run aveage. He broke or tied nine of the program’s game, season or career records. He was Babson’s Male Athlete of the Year for the senior class. “He’s the best player I’ve ever had at Babson,’’ said Matt Noone, who has coached at the Wellesley school for 15 seasons. To help defray Ahern’s medical bills, student loans, and rent, his friends have set up GoFundMe page, www.gofundme.com/DaveNeedsUs.